Power Source: Arcane. You gain your magical power from a pact you forge with a powerful, supernatural force or an unnamed entity. Trained Skills: None. From the class skills list below, choose 4 more trained skills at 1st level. Necromancers attack primarily using their minion's, attacks which cause additional secondary effects, and with a pact sword. Unlike ordinary warlocks, you deal damage in characteristically different ways. You sacrifice Warlock’s Curse (the extra damage die, or D6) and the other Warlock class features, for new one's which allow you to deal damage with a pact blade and cause harmful effects to the target, or control a summoned pet to attack for you. You have an option for two new pacts and character builds, The Summoning Pact and Pestilence pact. Each give pact gives you special abilities, which will influence and change the way you ordinarily do damage. Both subclass types lose the curse class feature, and instead gain the Summon minion class feature. Necromancer's gain access to regular warlock powers, as well as dailies and utilities from the Binder subclass of the warlock. You can pick any of the at-wills from PHB1 or Arcane Power, including Eldritch strike, as well as powers from either the Pestilence or Summoner pact, without having to be that pact. However, your choice in pact still determines one of your at-wills, Minion Attack or Havoc, respectively. Charisma or Constitution should be your primary ability. As almost all of your powers utilize either Charisma or Constitution for the attack and damage roll, one of the other is your most important ability. Your second most important ability is your dexterity, which boosts your special abilities and provides bonuses to reflex and AC with light armor. For a Pestilence based warlock, it will also determine extra damage for many of your attacks, making it essential for your damage. You can choose to go with Both Charisma and Constitution, with a recommended 18/18 with this build type. However, you will lose defenses and power for the added versatility. As a striker, your primary emphasis is on damage. Getting superior implement expertise, dual implement spellcaster, and other damage based feats are essential for your class. With your relativity low defenses, good defenses are a second option, which will allow you to survive attacks, especially at close range. Two-weapon defense is a viable option, as is various armor feats. A parrying dagger that is enchanted is a good way to boost your defenses and provides an additional +1 bonus to damage. Feats which boost necrotic or fire damage are highly recommended, as they are your primary power sources. A good implement is a must, especially as a warlock. Although you can use the Pact Blade as an implement, As you can use any dagger as an implement, a secondary weapon or rod or wand is ideal for extra damage. A superior implement can help you to do more damage, and your attack rolls are only contingent with one of the items. Due to your low defenses you may think of getting a parrying dagger and a rhythm blade, however this will likely consume your superior implement slot. With your pact blade, you already cover an implement and a weapon, however as dual implement spellcaster helps boost your damage with attacks, it is recommended that you pick up another. You have forged a pact with mysterious, dark entities that grant you your arcane powers. You can choose between two Eldritch Options, either the Summoner Pact or Pestilence Pact. You can pick a warlock at-will from any pact or Eldritch Blast, and gain one extra at-will power based on your character's Eldritich Pact. At-Will Spells: Your pact determines one of the at-will spells you know. This is Minion Attack with the Summoner Pact, and Havoc with the Pestilence Pact. Pact Boon: Each pact includes a pact boon. The Pact Boon determines how your Plague ability will function in the game and extra abilities associated with certain powers. Your choice between the "Summoner Pact" and "Pestilence Pact" decides characteristically which type of Necromancer you will be. The Pestilence pact allows access to new powers and abilities which deal damage traditionally and weakens the target in some way, and the Summoner pact which allows you to summon creatures to do attacks for you. The Summoner Pact favors Constitution, where as the Pestilence Pact favors Charisma, both of which can use dexterity as their secondary ability. You can still take encounter and daily powers from the Warlock class and powers from other pacts, however your at-will and other abilities are determined by your Eldritich Pact choice. The At-will power offered by the Pestilence Pact is "Havoc". The At-will power offered by the Summoner Pact is "Minion Attack". Based on the choice you took, you gain one extra power, which augments your ability. Further, you gain one extra power depending on the choice you make of either the Pestilence or Summoner Pact. This is the "Contagion" power for the Pestilence Pact, and the "Scourge" power for the Summoner Pact. Contagion (Pestilence Pact):Any target subject to an ongoing condition caused by one of your powers takes a -2 penalty to saving throw rolls. Further, ongoing damage caused by you can stack on the same target, even if that damage is of the same type. Scourge (Summoner Pact): When choosing the Zombie Minion option, you can summon a zombie and two extra ghouls with your "Summon Minion" Warlock Class feature. However, you can still only use the At-will "Minion Attack" once per turn, with one minion. Furthermore, unless you have used the At-will "Minion attack" during your turn, the other ghouls summoned by your Scourge (Summonor Pact) ability cannot make extra attacks. So, if you were to use another warlock power instead of "Minion attack", only one minion could attack per turn. You gain the choice between the "Prime Shot" class feature and "Pack Leader". With Pack Leader, your minion's gain a +1 bonus to attack rolls against targets that you are closer than them to or that you are adjacent to. Both pacts gain a different Pact Boon, which can allow for extra benefits when using certain powers. However, both Pacts gain "The Plague" special ability. The Plague: When a creature you have attacked within the last turn dies, it spreads the plague, which does ongoing damage equal to your dexterity modifier to each adjacent target, which a save ends. Furthermore, any enemy which walks in that dead creature's space also contracts the plague, and takes the same ongoing damage. "The Plague" and it's ongoing damage can be spread to any adjacent creature, to another creature that doesn't have the plague. So, if a creature that has contracted the plague is adjacent to another creature, you can choose for that creature to gain the plague. A creature who has gained the plague cannot spread it in the same turn it has contracted it. By choosing the Necromancer you gain access to a "Pact Blade". You can use a minor action to manifest your pact weapon. The pact weapon you manifest is the "Necromancer's Blade". The weapon persists until you no longer hold either it or until you dismiss it as a free action. You can make weapon attacks with your pact weapon, using its proficiency bonus and the appropriate damage die. The weapon cannot be enchanted, however it's enhancement bonus to attack and damage rolls is equal to an implement of your choice you are wielding. You can use the Pact Blade as an implement, and you add it's enhancement bonus to attack rolls and damage rolls. The Pact Blade qualifies as a light blade, has a proficiency bonus of +3, and has a damage of 2d4. On a crit, the weapon does 2d4 extra damage. The weapon is weightless and ephemeral, meaning that it presents no issue when being carried. The weapon can be stored in the twisting nether, an alternate dimension, where it can be retrieved with a minor action. The weapon qualifies as a melee weapon and can be used with melee basic attacks. Any power which possesses the weapon keyword can use the Pact Blade. When you make an implement attack and are wielding the pact blade, you can instead choose to make the attack a melee attack. If you do, you can add the Pact Weapon's proficiency bonus to the attack roll. Further, the attack gains the "weapon" keyword. The attack does the same amount of damage and loses the ranged property, however it adds the weapon's proficiency and enhancement bonus. When you use a power associated with your pact weapon and the power has both the weapon and the implement keyword, you are considered to be wielding both your pact weapon and your implement for the purpose of feats and other game elements. You summon an arcane minion of the damned, eager to follow your every command. Effect: You can summon an ordinary minion to fight by your side. Special: You can only summon a number of minion's per day equal to your minion threshold. In addition, you can only summon one minion at a time (unless another power specifies otherwise). You can summon a minion under your control to provide extra damage, a number of times per day equal to your Minion Threshold. The minion lasts until the end of the day or until it is killed. The minion can make move and minor actions separately from you, but you must take standard actions for the minion. Minion attacks are most often done through other Necromancer powers, such as "Minion Attack". The exception to the rule is the Zombie and Imp minion, which allow you to boost your damage in addition to your warlock attacks. As it is a minion of yours, it cannot speak to most creatures and does not have the common language, although it can speak to other undead and Necromancers. You can communicate with your minion Telepathically out to a range of 20 squares. The minion's attributes, capabilities, and damage are all determined by the minion of your choice. When minion's die, they disappear for the rest of the day, but can be re-summoned the next day. Minion's never truly die, as they simply return to the netherworld to heal, or can be reanimated. You gain a minion threshold, which limits how many minion's you can summon or resummon per day, which at heroic tier is 2 minion's per day. At level 11, you can summon a minion 3 times per day, and at level 21, you can summon a minion 4 times per day. You still cannot have more than one minion summoned at a time, unless a power otherwise specifies. Certain powers (especially dailies), allow you to summon additional minions. However, you can only summon these additional minion's a number of times equal to your daily value. So, for instance, if you summoned a Zombie minion one time in a day, you could only summon one daily minion for that day (although you could still use that daily power, just not summon the minion). Summoning daily minion's often dismiss your primary minion, but this minion can be resummoned without counting towards your daily value (unless otherwise stated). A list of Necromancer minion's can be found in the Necromancer Minion's (4e Creature) page. Necromancer minions are an important part of the Necromancer's damage, just like the Ranger's Quarry or Warlock's curse. For all intents and purposes, they count as another creature, and thus provide flanking benefits for combat advantage. They are capable of opportunity attacks. In addition to this, they provide extra damage. 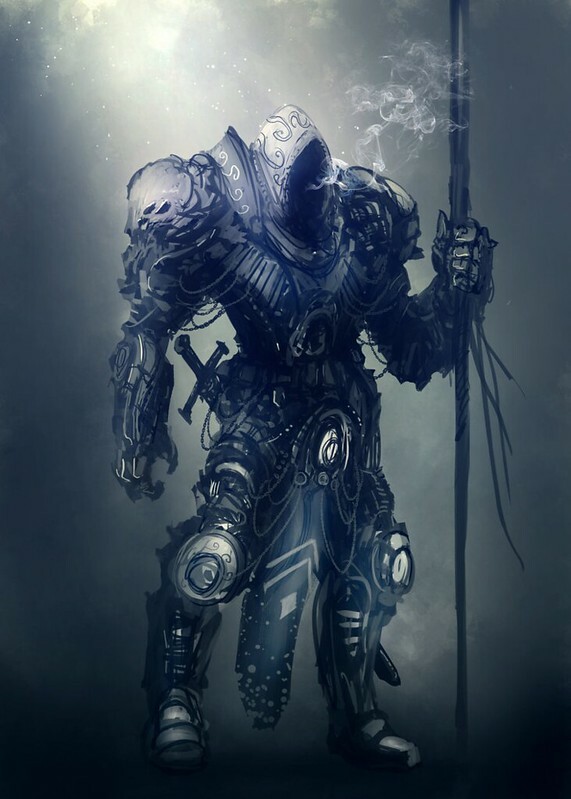 Some minion's are designed to be incredibly powerful and do damage in place of the User's attacks, while others are designed to boost the damage of the Necromancer, more or less replicating abilities like Hunter's Quarry or Warlock's Curse of similar striker classes. They also allow multiple targets to be targeted, giving them the ability to pick off multiple enemies at once. Necromancers's are an extension of the Necromancer themselves; any creature they kill or do damage to count as the Necromancer, and their attributes are based on the Necromancer's own. Further, they use the Necromancer's strength to determine their own attack and damage rolls, as well use a fraction of the Necromancer's health. Their defenses and skill bonuses also improve by the Necromancers, or 1/2 the Necromancer's level. Any armor enhancement bonuses you receive from your equipment are also added to the minion's defense bonuses. Minion's gain your implement enhancement bonus to attack rolls; as your weapon can serve as an implement, this bonus can be the equivalent of your weapon. They do not however gain any special effects from your weapon or implement when attacking, just the enhancement bonus to attack rolls. Benefit: You gain one of the following powers, based on your Pact Choice. With the "Summoner's Pact" you gain the "Minion Attack" at-will power, and with the Pestilence Pact you gain the "Havoc" at-will power. After your pact has determined one of your at-will powers, you can choice from these or other warlock at-will powers. Your minion viciously attacks the enemy, eager to serve your every command. Effect: Your minion makes an attack against one creature within it's range. On a successful hit, the minion adds your constitution modifier, enhancement bonus, and other benefits as if you had made the attack (such as extra damage from feats or paragon paths) as extra damage on the damage roll. Special: This power can be used in place of a melee or ranged basic attack. In addition, it doesn't provoke opportunity attacks for being ranged. Note: Your minion's attack is treated as an implement attack by you. So for instance if a feat were to provide a bonus to the attack roll, such as "implement expertise", you would add the bonus to the attack roll of the minion. The minion still uses it's damage, targets the defense specified with it's attack, possesses the same range, and does the same damage as it would otherwise. Hit: 2d6 + Charisma modifier and Dexterity modifier Damage. In addition, the target is slowed. Effect: You grant combat advantage to the target until the end of your next turn. Special: (Pestilence Pact) The target also takes a -2 penalty to saving throws. You impart and unholy disease upon your enemy, eating away at their flesh. Trigger: Your minion hits a creature with an attack. Effect: You deal 1d10 extra damage to the creature who is the target of the attack. In addition, the target is slowed (save ends). Special: You may only use one Necromancer encounter power per turn, even if you have other actions available. Ripping open a portal in our dimensional realm, you rain down the fires from hell. Effect: The target takes 5 ongoing damage and is dazed (save ends). Special: You grant combat advantage until the end of your next turn. You summon a Zombie minion, summoning the powers of the undead. Effect: You summon a Zombie Minion in an unoccupied square within range of the power and adjacent to an enemy, which it makes a melee basic attack against. On a successful hit, the zombie does 2D8 + Strength extra damage. Special: 2 turns after the daily power is activated, the zombie minion is dismissed. However with a sustain minor, the zombie persists until the end of your next turn (until the end of the encounter). While the daily power counts towards your total minion limit if you exceed the 2 turn limit, it does not dismiss your primary minion. *Note: This power can only be used with regular minion's, and not special minion's. You cripple the enemy, granting one of the many effects of decay. Effect: You deal 1d8 extra damage to the creature who is the target of the attack. In addition, the target is dazed (save ends). The target undergoes incineration, bursting immediately in to flames. Effect: The target takes 5 ongoing damage and takes a -1 penalty to all defenses (save ends). In a sudden blaze of fire and darkness, a meteorite soars through the sky, tearing a hole between our dimension and the Twisting Nether, unleashing an infernal Guardian from the pits of hell. Effect: You summon an infernal minion in the place of your current minion. Each target adjacent to the Infernal on a successful Strength + 2 vs. Reflex attack takes 2D10 + Strength modifier damage. Special: 2 turns after the daily power is activated, the Infernal Minion is dismissed and your original minion is resummoned in it's place, without counting towards your daily value. However, you can choose to dismiss your current minion on the field to be replaced with the Infernal for the rest of the encounter, if you have not yet today exceeded your minion threshold, however this counts against your minion threshold. When your infernal minion is dismissed (at the end of the encounter or otherwise), your previous minion is resummoned and does not count towards your minion threshold. Benefit: You choose one of the following powers. You inflict confusion upon the target, disorienting them with your arcane powers. Effect: You deal 2d10 extra damage to the creature who is the target of the attack. In addition, the target is slowed (save ends) and knocked prone. Your fire is as bright as it is hot, burning with an intensity that's effect is blinding to it's victims. Effect: The target takes 5 ongoing damage and is blinded (save ends). After an intense ritual session, the blessed soulstone conjures a demon from the pits of hell, unleashing a chaotic, unwordly creature, barely contained by your powers in combat. Effect: You summon a Doomguard minion in the place of your current minion, and it can make a melee basic attack against one adjacent enemy. On a successful hit, add 2d10 extra damage to the damage. Special: 2 turns after the daily power is activated, the Doomguard Minion is dismissed and your original minion is resummoned in it's place, without counting towards your daily value. However, you can choose to dismiss your current minion on the field to be replaced with the Doomguard for the rest of the encounter, if you have not yet today exceeded your minion threshold, however this counts against your minion threshold. When your Doomguard minion is dismissed (at the end of the encounter or otherwise), your previous minion is resummoned and does not count towards your minion threshold. Alternatively, you can choose for the Doomguard to be "released". When released, the Doomguard does not count against your daily minion value and does not require a sustain minor. Once released however, a Doomguard will begin to attack enemies and allies alike at random. Assign a random number to each creature within the attack range of the Doomguard, and use a random number generator or dice equal to the number of creatures within the Doomguard's attack range. When that creature's number comes up as a result of the random number generated, the Doomguard will move to attack that creature. Once a Doomguard is released, the Doomguard will continue to attack random targets until it is dismissed or killed. Benefit: You gain the level 11 features of your chosen paragon path. The suggested Paragon Path is the "Undead Lich", path. (Level 11): You gain a +1 bonus to all attack rolls. (Level 11):. As a further progression of your power over the undead, you are now immortal, and you never have to eat, drink, sleep or breathe. You never have to make an endurance check to resist the effects of suffocation, starvation, or disease, and are immune to many effects that generally effect the living. (Level 11):. When you spend an action point to make a roll for an action, you can roll twice and choose the higher of either result. (Level 16):' When flanking, your minion can provide combat advantage for both you and your allies. You summon an ancient race of Dragons, lost since forgotten in the Earthly realms. Effect: You summon a Protodragon minion in the place of your current minion. In then makes an attack (Close Blast 4) against each enemy in the blast, against their reflex defense (+2). On a successful hit, this damage is equal to 2d10 + Your Strength modifier. Special: 2 turns after the daily power is activated, the Protodragon Minion is dismissed and your original minion is resummoned in it's place, without counting towards your daily value. However, you can choose to dismiss your current minion on the field to be replaced with the Protodragon for the rest of the encounter, if you have not yet today exceeded your minion threshold, however this counts against your minion threshold. When your Protodragon minion is dismissed (at the end of the encounter or otherwise), your previous minion is resummoned and does not count towards your minion threshold. Your very essence defies the presence of death, resisting it at every turn. Trigger: You drop at or below zero hitpoints. Effect: You are no longer dying and can spend two healing surges to regain hitpoints equal to your bloodied value. Death not only cripples man himself, but his very will. Trigger: Your minion targets a creature with an attack. Effect: You can target the will defense with the attack. In addition, you deal 2d12 extra damage to the creature who is the target of the attack, and the target is blinded (save ends). Effect: The target takes 5 ongoing damage and is slowed (save ends). You summon a horrific, Ghastly beast, a combined etching of a dozen men, blended in to one, horrific, nasty creature. Effect: You summon a Patchwork Horror Minion in an unoccupied square within range of the power and adjacent to an enemy, which it makes a melee basic attack against. On a successful hit, the Patchwork Horror does 3D8 + Strength extra damage. Special: 2 turns after the daily power is activated, the Patchwork Horror minion is dismissed. However with a sustain minor, the Patchwork Horror persists until the end of your next turn (until the end of the encounter). While the daily power counts towards your total minion limit if you exceed the 2 turn limit, it does not dismiss your primary minion. Your diabolic tendrils surround the enemy, holding them in their grasp. Effect: You deal 3d8 extra damage to the creature who is the target of the attack, and the target is weakened (save ends). You light your enemies aflame, diminishing their ability to fight. Effect: The target takes 10 ongoing damage and is stunned (save ends). From the twisting nether comes a creature born of fire and stone, chained only by the master's will, and pushing the upper limits of what any Necromancer can conceivably contain. Effect: You summon an infernal minion in the place of your current minion. Each target adjacent to the Infernal on a successful Strength + 5 vs. Reflex attack takes 4D10 + Strength modifier damage. A titan, summoned from the deepest depths of earth, their near Demi-god status grants them immense power, and dominion over living things. Effect: You summon a Vrykul minion in the place of your current minion. The Vrykul then makes an attack (Close Burst 2) against each enemy in the burst, vs. reflex. On a successful hit, this damage does 4D10 + Strength modifier damage. Special: 2 turns after the daily power is activated, the Vrykul Minion is dismissed and your original minion is resummoned in it's place, without counting towards your daily value. However, you can choose to dismiss your current minion on the field to be replaced with the Vrykul for the rest of the encounter, if you have not yet today exceeded your minion threshold, however this counts against your minion threshold. When your Vrykul minion is dismissed (at the end of the encounter or otherwise), your previous minion is resummoned and does not count towards your minion threshold. Those who escape death are only made weaker by it's touch. Effect: You can target reflex with the attack. You deal 3d10 extra damage to the creature who is the target of the attack, and in addition, the target is restrained (save ends). A spiraling inferno engulfs the field, imparting your indellible wrath. Effect: The target takes 5 ongoing damage and is weakened (save ends). After an intense ritual session, the unholy soulstone conjures forth a demon from the pits of hell, with your powering opening up the gates to many creatures. Effect: You summon either a Doomguard or Infernal minion in the place of your current minion, and it can make a melee basic attack against one adjacent enemy. On a successful hit, add 4d10 extra damage to the damage. Special: 2 turns after the daily power is activated, the Minion is dismissed and your original minion is resummoned in it's place, without counting towards your daily value. However, you can choose to dismiss your current minion on the field to be replaced with the Minion for the rest of the encounter, if you have not yet today exceeded your minion threshold; however this counts against your minion threshold. When your Minion is dismissed (at the end of the encounter or otherwise), your previous minion is resummoned and does not count towards your minion threshold. Alternatively, you can choose for the Minion to be "released". When released, the Minion does not additionally count against your daily minion value and does not require a sustain minor. Once released however, the Minion will begin to attack enemies and allies alike at random. Assign a random number to each creature within the attack range of the Minion, and use a random number generator or dice equal to the number of creatures within the Minion's attack range. When that creature's number comes up as a result of the random number generated, the Minion will move to attack that creature. Once this Minion is released, it will continue to attack random targets until it is dismissed or killed. All in life must inevitably face, oblivion. Effect: You deal 4d10 extra damage to the creature who is the target of the attack. In addition, the target is stunned and deafened (save ends). Special: You may use this power with other Necromancer encounter powers. "Hellfire, hellfire, it's burning in my skin... hellfire, hellfire, it's turning me to sin." Effect: The target takes 10 ongoing damage and is dominated (save ends). A disgusting, nasty beast, sewn together from the bodies of many men; created from the work suited only to a butcher, and the most cynical of all men. Effect: You summon a Patchwork Horror Minion in an unoccupied square within range of the power and adjacent to an enemy, which it makes a melee basic attack against. On a successful hit, the Patchwork Horror does 5D8 + Strength extra damage.